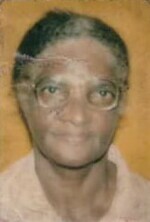 Cynthia Agusta Boyce, aged 85, late of Johnson Land, Whitehall, St. Michael. Formerly of Whitehall Main Road. Sister of John Boyce (Cave Hill, St. Michael) and the late Dorothy Mayers, Luther and Samuel Boyce. Aunt of Yvette Mayers-Best, Peter and Henderson Mayers, Yvette Greenidge, Gail Wood, Keith, Charles, Winston and Milton Boyce (J B’s Shop) and several others. Relative of The Boyce, Gibbs, Griffith and Holligan families. The funeral of the late Cynthia Agusta Boyce, leaves Tudor’s Funeral Home, The Ivy, St. Michael on Monday, February 4, 2019 at 12:15pm for The Church of the Nazarene, Bank Hall Main Road, St. Michael where relatives and friends are asked to meet at 1:30pm for the Service. The cortege will then proceed to the Westbury Cemetery for the Interment. The organist is kindly asked to attend. Flowers may be sent to Tudor’s Funeral Home no later than 12 noon on Monday. The body will repose for viewing in the Chapel of Tudor’s Funeral Home on Sunday, February 3rd, from 4:00pm until 6:00pm.